It’s time to get the cleaning gloves on and the paintbrush out if you want to get your property in shape and ready to sell this year. The start of a new year is a great time to assess your selling goals and start chatting to property agents to get a good idea of what you need to do at your property to sell for the best price possible. You may not be ready to sell your home right away but by preparing early you can get a head start on any necessary property improvements and potentially time your sale so it takes place during a busy buying period. Focus on landscaping –Make sure your property looks neat and tidy and has solid street appeal to reel buyers in. Make a grand entrance – First impressions count! This means that the first room that people walk into should make a positive impression. This could shape how buyers view the rest of the property. Add a coat of paint – Fresh and modern paint colours will provide an instant property update both inside and out. This will make a property appear better in person, as well as in online photos where buyers often first discover a property. Remove the clutter – When you sell a property you want to sell the lifestyle that comes with it too, and that doesn’t include the washing up! If there is clutter and mess around your home this should be dealt with as a first priority. 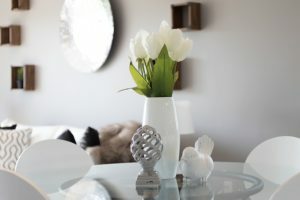 Make it light and bright – Light helps create a sense of space and calm, so it’s important to let as much light into a property as is practical. Consider things like new window treatments, skylights, mirrors or fresh paint colours to help lighten up rooms. Overhaul the kitchen – The main hub of the home will have a big impact on buyers, so make sure it’s a good one. Inexpensive updates include resurfacing cupboards and bench tops and replacing door hardware. Clean up bathrooms – For a sparkling clean bathroom that will impress even the most discerning buyers, clean all fixtures, tiles and grout, and leave no trace of any mould or mustiness. Fix it if it’s broken – Buyers will overestimate what it costs to fix even the most basic of items in a home. Plus, if anything is broken it will leave a generally bad impression. So don’t leave any stone unturned and make sure everything in the property is working before selling. Don’t forget the garage or shed – It might be normal for these rooms to get dirty and messy in day-to-day life, but that doesn’t mean they should be when selling. Every inch of your home should be clean and ready to make a good impact on buyers. Take advantage of the pros – If there’s any aspect of getting your home ready for sale that seems too tough then you can always ask for help. There are a number of service providers available to help make your selling journey easier including landscapers, tradespeople, cleaners, property stylists and much more. Your sales agent will be able to help with recommendations or point you in the right direction of what needs to be done to help you turn your property into the best property on the block. Contact Professionals Triwest Real Estate if you need tips or advice to help you sell your home in 2019.